Click on any work, or scroll through the set, to find out more about the artwork, the locations and hybrid process. 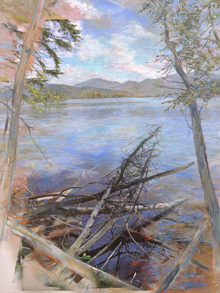 In connection with the exhibition Picturing America: Signature Works from the Westmoreland Museum of American Art, The Hyde will present an exhibition of recent work by the Saratoga-based artist Anne Diggory, who pictures America through her fresh approach to the Adirondack landscape. Her new work explores “hybrid media,” a multi-layered process combining sections of photography, digital manipulation and painting. The resulting disruptions of the surface convey the energy of the artist’s response to dynamic subject matter. The exhibition will feature sixteen dramatic landscapes that juxtapose moving water, changing skies, and temporary clutter against the seeming permanence of the American terrain. Organized by The Hyde Collection. General admission $8; seniors (60+) $6; students with ID free; active duty U.S. military and their families free; Hyde members free. Lecture free with admission. Museum hours: Tuesday – Saturday: 10am – 5pm; Sunday: 12noon – 5pm; closed Mondays and most national holidays. Artistic Choices in the work of 19th century painter John Frederick Kensett and my own work. Anne Diggory will present her ongoing research into the relationship of motif to finished work in the paintings of 19th century artist John Frederick Kensett at Lake George. She has been paddling and boating around the lake during the last 10 years in search of Kensett’s painting locations, photographing what inspired him and creating her own artworks, which will also be a part of the presentation. Her research into the painting location of Kensett’s iconic Lake George, 1869, was recently published in the Metropolitan Museum Journal, in an article that corrects their catalogue by moving the location from Crown Island to the eastern side of Homer Point. Her research both corrects the misconception that he altered the topography and clarifies what artistic choices he did make to convey the drama of light on the landforms at the lake. In the creation of her own works based on the same locations she became more aware of the effect of the conventions of 19th century and contemporary art. Diggory will be available after the talk in the Hoopes Gallery to talk informally about her exhibition, “Hybrid Visions”. I use the term “hybrid” to convey the idea that I am harnessing the interactive power of photography, digital manipulation and painting. The first work to introduce elements of photographs of a location was Opening: Barnum Brook II, which opens the exhibition of sixteen works from 2006 to 2014. I have continued to create hybrids when the combination of visual material the and increased artifice can be used to emphasize the complex act of looking and the energy of shifting vision. While each year I also produce more traditional paintings and drawings (see www.diggory.com), certain experiences or ideas seem to require the hybrid approach.